Day 3 is my turn to jump into the hop. Each day of the hop Inspired by Fabric will be giving away a FQ bundle, so be sure to go and sign up to follow their blog, either by email or blog reader, and then come back and leave a comment on my blog. 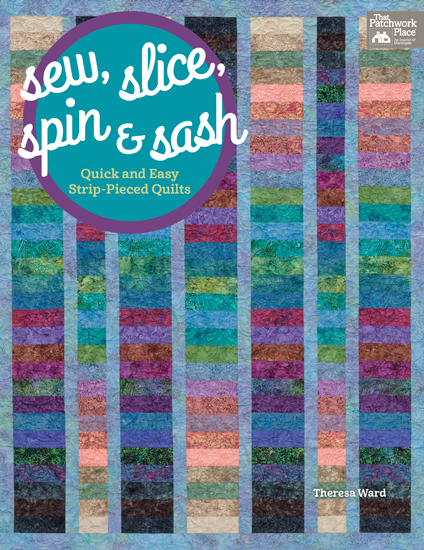 I will give away an e-book of my book “Sew, Slice, Spin and Sash” from all the comments. It was hard to choose from all the patterns, but I finally chose to make the Dutchmans Puzzle block. It’s made using 8 flying geese (FG) units and my favorite way to make FG is doing the no waste method. On the background squares, using a mechanical pencil, mark either a diagonal line from corner to corner, or do the double line, like what is shown below. If you make the single line, sew 1/4″ on both sides of the line. Place two of the background squares onto each of the large squares. Sew just to the side of the marked line. After sewing all 4 lines, cut apart between the sewn lines. Press away from the large triangle. Take the remaining background squares and place on the large triangles. Sew on the drawn lines, cut apart. You now have four FQ units of each color. At this point, I like to trim off those little pieces sticking out. You now have everything ready to sew your block together. Using a dark and a light goose, make 4 blocks with the dark goose on the bottom. Press toward the top goose. Sew 2 blocks together. Make 2 sets. 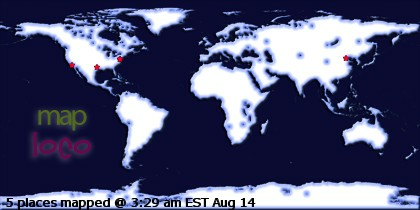 Press toward the blue goose in the upper right hand square in the picture below. Now sew the two sets together, and your block is done! When pressing the final seam, make the little twist in the center, so that your seams will lay nice and flat. Here’s the other colorway I chose. Don’t forget to leave a comment to get in on the drawing. Have fun hopping!! !Next stop is Pat Speth! I love your flying geese method – no waste there! Thanks for sharing it! I love the no-waste flying geese method. It makes flying geese blocks a snap. HI,isn’t this a fun block! Love making it+love yours too! Thanks for sharing! This is a great method to make flying geese. 3 7/8″. This formula works for all FG units where the width is twice the height of the unit. I am an email and bloglovin subscriber to Inspired by Fabric. I love the easy way of putting together the flying geese and will be trying that method soon. Thanks for the tip. This is one of my favorite blocks and method to make it. Thank you. I get Inspired by Fabrics post via email. What a fun block you chose. I too like the no waste method for making flying geese. Love your fabric choices too. What would our grandmothers thing on the way we approach quilting today. Maybe “you go girl”. Thanks for showing a quick and fabric saving way to make flying geese. I really love this type of fabric! I love the ease of putting your block together! Thanks for the tutorial for your pretty block, and your comment response on how to figure the size of the blocks for the geese. I’ve found this is the most accurate way to make flying geese. Thanks for the great tutorial on Flying Geese. It’s a great time saver. Love the Flying Dutchman’s block and use the no-waste method for making the geese. Thanks for the giveaway! Their email brought me here today. I like your colorway. Great looking blocks. I like that method of making the Flying Geese units. What a great tutorial and your block looks happy! Love your block and the way you make flying geese. Beautiful fabrics! I am loving what I see of this fabric line. Thanks for sharing the quick 4 at a time geese method. This is my favorite way of making flying geese. Love your block! I love making flying geese this way. Your block is very cute! Very cute block. I use learned this method for flying geese – it’s awesome! Those Flying Geese are sewn to Perfection with your method. This is one of my favorite blocks. I love the way you did your flying geese. Thanks for the giveaway. Thank you for the detailed tutorial for the flying geese quilt block. I never knew to sew over the intersection (where the smaller blocks overlap) until now. Love your color choices. Thank you for the inspiration. Thanks for the great tutorial. Really love this vintage fabric. This is the best way to make flying geese. Your tutorial was well done. Love your blocks and really liked your tutorial for the Easy Geese-I will have to try asap! I always appreciate tips and tricks like this one to make quilting easier and more fun, especially when there is no wasted fabric! This truly is a darling block and one I’d like to make an entire baby quilt with! Thanks. I HAVE GOT TO TRY MAKING FLYING GEESE THIS WAY!! Thanks for your flying geese tutorial. I follow the Inspired by Fabric blog. This is such a great block! Thanks for the tutorial. Love these fabrics and the blocks you made. I have never had much luck with the no-waste flying geese method that you used, but I will have to try it again! I have always just drawn the one line and sewed 1/4″ away from the line on each side. Next time I will use the double lines to see if it is better. This block is one of my favorites, and I also love the No Waste method for geese. Thanks for the pretty inspiration. What a quick and easy way of making flying geese, I’ve used it a few times myself. Love your block and the fabrics! Love your flying geese tutorial and especially the blue block!! Thanks for sharing. I like flying geese — lots of different ways to arrange them! Your block is cute. this is one of my favorite blocks, thanks for the tips. It was not until this year that I learned how to make the no waste flying geese and just love the method. I have never made the Dutchman’s Puzzle block but it sure looks like a great block to explore fabric choices with. Thank you for your great tutorial and an opportunity at winning a copy of your book! Have a fantastic creative day! Love your no waste geese…and this block! Your blocks turned out great. Thanks for the tutorial and giveaway! Great tuitorial for no waste on the flying geese! I’m crossing my fingers for a win! I forgot to say that I’m signed up! I follow Inspired by fabric emails. Love this method for making flying geese! I love the fabric you have used. It reminds me of past times when things were simpler (at least I hope they were). I also love making flying gleese but I prefer to do them by paper piecing. Thank you very much for the tutorial. This is, by far, my favorite way to make flying geese, love the no waste way. I love the pinwheel aspect of this block. I’m subscribed by email. Thanks! Nice block pattern and good instructions! Thanks for the tutorial. I love the movement in this lovely block. Thank you. I love your block and technique!!! Love your block and technique. Thanks.